Vintage and Museum Quality Specialists. 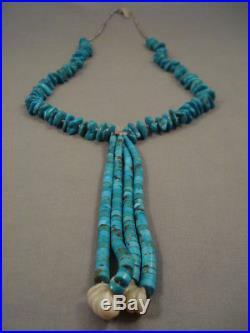 This stunning necklace has a jacla with 4 strands of graduated handcut Old Kingman turquoise discs and white shell pendants! The jacla measures about 5-1/2 in length. 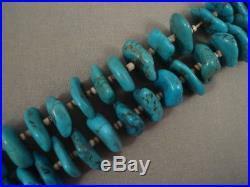 The largest of the turquoise stones measures about 5/8" x 3/8". The largest handcut turquoise discs measures around 1/4" x 1/4". White shells measure about 1/2" x 3/8". 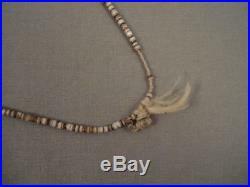 The length of the necklace measures around 30. We are flexible and are happy to work with you! All international orders will cost only 12.00. We also will work with international buyers to help them not pay as much going through the process. Nativo Arts was established to offer the largest selection of the best quality vintage Native American jewelry in the world, for the best prices. It has taken decades to acquire the collection that we offer to the world today. From A-list celebrities to average Joe's, we work with everyone from all walks of life. Nativo Arts has supplied a vast number of movies with the best quality Native American jewelry. It is important to respect Native American culture and to realize how much difficulty and hard work an artist puts into a piece. We thank you for your interest and we are happy to work with you! "The Largest Collection of Museum Quality Vintage Native American Jewelry in the World". The item "UNIQAUE AND OLD! 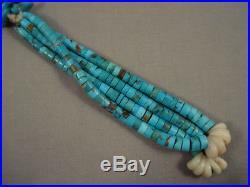 VINTAGE NAVAJO/ SANTO DOMINGO TURQUOISE JACLA HEISHI NECKLACE" is in sale since Saturday, September 30, 2017.